LawrenceCoArchives.com adheres to the highest standards in assuring our visitors' privacy. All information - including customer accounts, transactions, and all correspondence, are handled with the utmost discretion. The policies below are applicable to LawrenceCoArchives.com and other sites on the World Wide Web originating in the US and owned and operated by the Lawrence County Archives unless otherwise indicated. 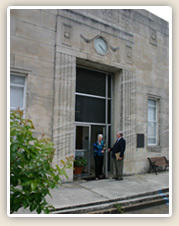 The only personal information collected by LawrenceCoArchives.com through our web site is information which is submitted to us voluntarily and knowingly by site visitors. When you simply browse our sites, no personal information is being collected by LawrenceCoArchives.com. Some functions and services that may be offered through our site require that you provide certain personal information, for example, when you place an order, request information, or register for a mailing list, we may need your postal and/or e-mail address, and a phone number for notification purposes only. If we choose to add an online registration, the form will contain clear wording indicating that by submitting the form you have read this document and understand that you will be entitled to receive e-mail correspondence from LawrenceCoArchives.com, our affiliates and partners. Web site visitors over the age of 18 who have submitted their names, mailing addresses, or e-mail addresses may occasionally receive e-mail correspondence from LawrenceCoArchives.com, our affiliates and partners containing information such as newsletters. Our purpose is to provide visitors with useful information and offers that will interest them. LawrenceCoArchives.com will consider permission granted to send such information if a form is submitted. If you do not wish to receive these offers, please do not submit the form. LawrenceCoArchives.com will not share e-mail addresses we collect through our web sites with any unaffiliated third parties. LawrenceCoArchives.com may provide aggregate statistics about our customers, traffic patterns and related site information to reputable third parties for statistical analysis, but these statistics will include no personally identifying information. You may use the address above for general customer service questions. You may also use this address to communicate that you'd prefer not to receive LawrenceCoArchives.com mailings and/or mailings from other companies to which we make our postal mailing list available. No information should be submitted or posted at LawrenceCoArchives.com Online Web Sites by individuals 17 years of age or under without their parent's or guardian's permission. No information collected from online guests 17 years of age or under is used for any marketing or promotional purposes whatsoever by LawrenceCoArchives.com. Unless otherwise disclosed at collection, LawrenceCoArchives.com does not provide any personally identifying information collected through our web sites from individuals 17 years old and under, regardless of its source, to any third party for any purpose whatsoever. Note to parents: If your child has submitted his or her name through a LawrenceCoArchives.com web site, and you wish to have that information corrected or deleted from our records, please communicate your wishes to us at the address above. LawrenceCoArchives.com pledges to exert reasonable efforts to assure that the information is deleted as soon as possible. We encourage parents to be aware of their childrens online activities, and to learn about software which can filter objectionable materials. If you submit your name through a form on a LawrenceCoArchives.com web site to request information from an advertiser or other third party, LawrenceCoArchives.com is not responsible for any marketing or other use of your name by the third party. To learn more about any other company or organizations privacy policies, we suggest visiting their web site or contacting them by postal mail or telephone. LawrenceCoArchives.com does not utilize Bullentin Boards on its' web site at this time. If you send LawrenceCoArchives.com an e-mail message, we may retain that message and your e-mail address, as well any response we send you. LawrenceCoArchives.com web sites may include links to web sites of other companies unaffiliated with LawrenceCoArchives.com. We do not log visitors clicks from our site to other sites. Please note that we are unable to review all such sites and take no responsibility for the content of any unaffiliated web site.